Until now, short throw and ultra-short throw projection has been limited to smaller, lower brightness, fixed lens projectors. 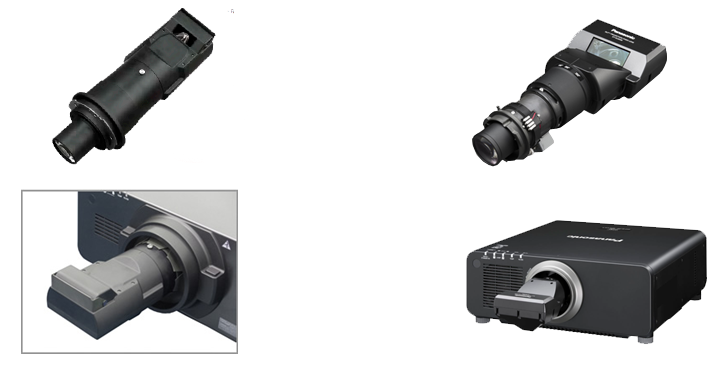 Panasonic has changed this with the ET-D75LE90 and ET-DLE030 ultra-short throw lenses for high brightness projectors. These are the world’s first detachable Ultra Short Throw lenses. By mounting the ultra-short-throw lenses onto Panasonic's high brightness DLP™ projector, you can shorten the projection distance by approximately 60 % compared with our current short throw lenses. This huge savings in space lets you project images in spots where you previously could not—such as places where the ceiling is too high, or where there is not enough front or rear space for projecting. The lens vertically redirects light cast at a distance of just 370mm from the projector to produce a bright, perfectly symmetrical sided image directly above it. 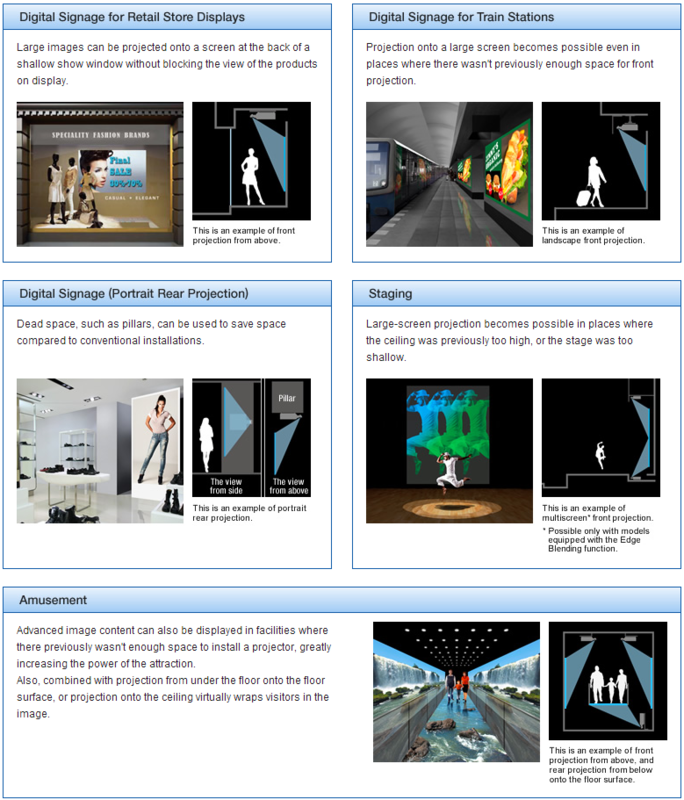 This is achieved by a cleverly designed mirror system and brings about new and exciting possibilities, unachievable with front projectors especially for applications in digital signage, retail, indoor staging. This technology has implications not only for creating a big visual impact and an almost illusionary experience for viewers, but also for making projection possible in small spaces where it would have been costly and difficult to project big images in high brightness. This applies to vertical markets such as staging, museum, or transport where it may not be possible to suspend a projector mounting bracket or where there is insufficient space, either in front or behind the projector to throw the image to the required size. Panasonic’s short-throw lenses can be used in both vertical and horizontal edge blending to make screens even larger, with the chip DLP technology. With the addition of Panasonic’s geometric adjustment technology, more advanced effects with greater impact can now be achieved. Geometric adjustment can also be used to create eye-catching applications on curved or uneven surfaces. For example, in a museum or theme park environment it could be possible to create a bended or curved picture, even when people are standing very close to the screen, no shadow is cast. The lenses are also the first exchangeable ultra-short throw system meaning that great flexibility is added to the latest range of Panasonic high brightness projectors. ET-D75LE90 and ET-DLE030 are compatible with all single chip and 3 chip DLPTM projectors including old models that are already installed in the field to give installers, integrators and end users the widest possible backwards compatibility and value.